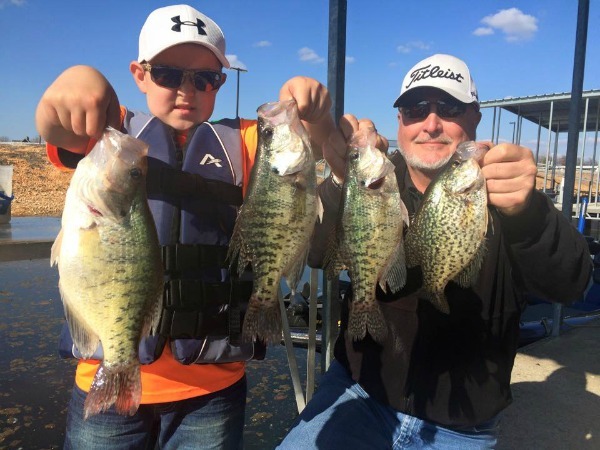 While we’ve been hearing stories of people catching a bunch of crappie, we’ve also been hearing stories the other way…like, where are all the fish!? Luckily, we’ve got local guide Tony Coatney here with the latest Grand Lake fishing report to help us out in finding those fish. So here is Tony with his latest fishing report, including details on where to find those crappie right now! Well, I have been back from South Texas for 2 weeks and been on the water everyday since. But, I haven’t been bass fishing – only been crappie fishing and let me tell you it has been unreal! I have had limits every day I have been guiding (which is every day!) and it hasn’t been easy but I have never seen these crappie doing what they are doing right now. I’ve been catching them in 30 to 40 foot of water in the middle of the coves – not near the docks or brush – but out in the middle. Been throwing Bobby Garland Stroll’r monkey milk and it doesn’t get any better. Also some electric chicken. You have to use your electronics to find them – when you see your graph black out in the middle looking like shad, well, its crappie. Also went to the river Sunday. Everything is muddy. Had an awful day until I talked to someone and it turns out I didn’t go up far enough. So, we went back to the main lake and limited out on crappie. Also caught some good large mouth while crappie fishing, but hear the bass fishing has been very tough. Weights have been high but a lot of people catching nothing. Haven’t heard anything about the catfish and the spoonbill are up the rivers.